A paradise of more than 20,000 acres sprawled across the eastern top of the rugged Cumberland Plateau, Fall Creek Falls State Park is one of the most scenic and spectacular outdoor recreation areas in America. Laced with cascades, gorges, waterfalls, streams, and lush stands of virgin hardwood timber, the park beckons those who enjoy nature at her finest. 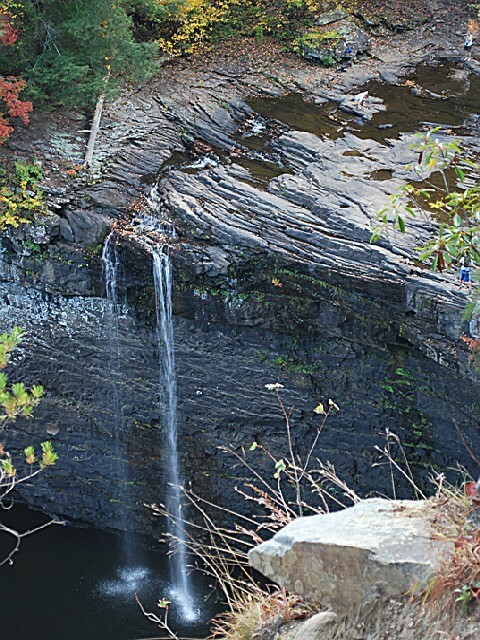 While Fall Creek Falls, at 256 feet, is the highest waterfall in the eastern United States, other waterfalls in the park are Piney and Cane Creek Falls and Cane Creek Cascades. 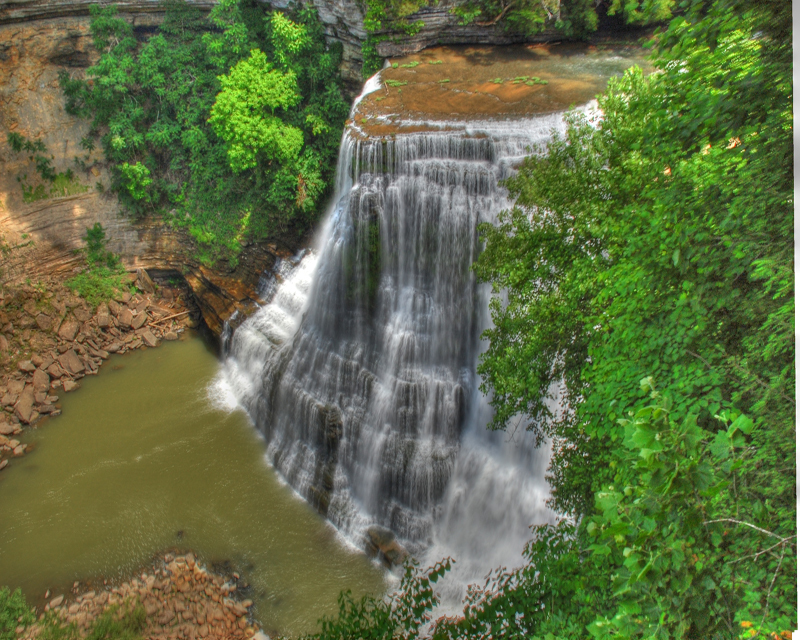 Fall Creek Falls State Resort Park is one of the most scenic and spectacular recreation areas in America. 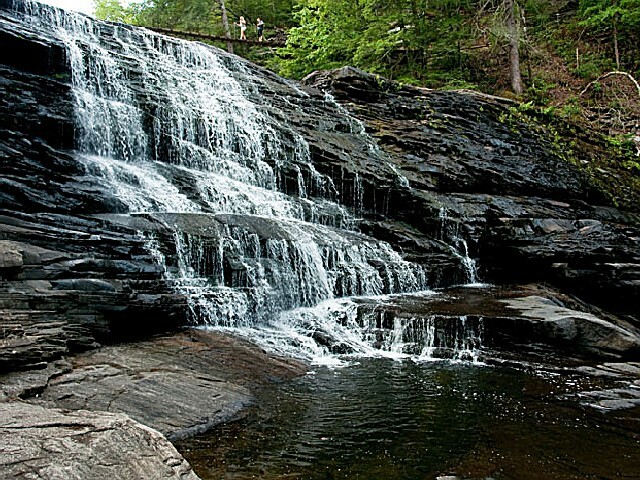 Its waterfalls, cascades, sparkling streams, gorges, timberland and an unmatched variety of recreation facilities and activities have made it one of the most popular parks in the Southeast. Fall Creek Falls is one of the highest waterfalls east of the Rocky Mountains, plunging 256 feet into a shaded pool at the base of its gorge. 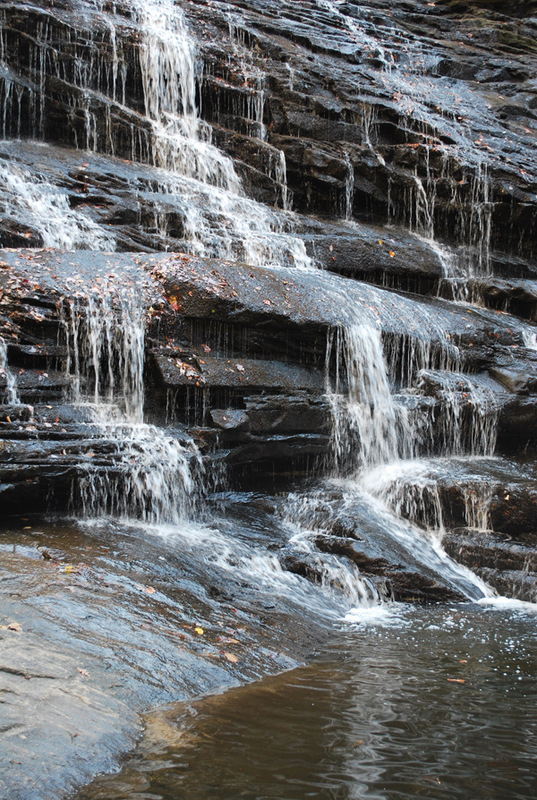 The park's other falls, (Piney, Cane Creek and Cane Creek Cascades), though smaller, are just as impressive. 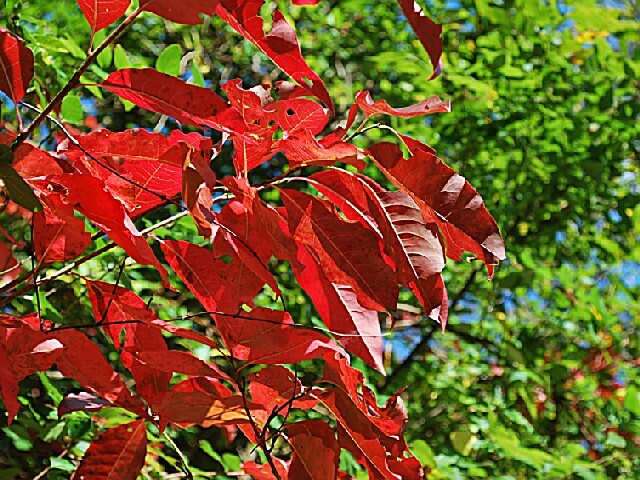 The park is located in Bledsoe and Van Buren counties, 11 miles east of Spencer and 18 miles west of Pikeville. It may be entered from Highway 111 or Highway 30. The park features 20 two-bedroom cabins which can sleep eight and 10 three-bedroom villas which can sleep ten. All cabins are fully furnished, have central heat/air and are fully equipped for housekeeping with linens, cooking and serving utensils, telephone, vcr and color cable tv provided. Each has a fireplace with firewood provided during the months of October through May. 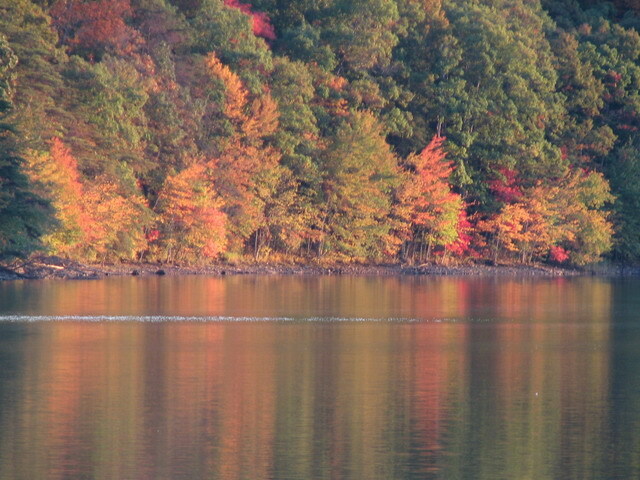 The 10 fishermen cabins are two-story cabins located directly on Fall Creek Lake. Fisherman cabin guests enjoy outdoor cooking, sunbathing, and fishing from their private porches situated out over the lake. There are also 10 landside cabins located on a hill overlooking the lake, each complete with patio, picnic table, and grill for cooking and dining outdoors. One landside cabin is accessible to persons with a disability. One cabin is available to guests with pets and all service animals are allowed. Accommodates 100 people, with complete cooking facilities. The building is a dormitory type building, all under one roof, with 46 bunks upstairs for the ladies and 44 bunks downstairs for the men. There are four staff rooms with two twin beds in each room. Complete kitchen facilities with steam tables, commercial dishwasher (bring your own detergent) and utensils are included. There is a fireplace in the dining hall. Bring your own personal items. Group Lodge 2 consists of two buildings, each sleeping 22 people. The cabins each contain twenty-two (bunk) beds, a restroom and a kitchen in each. The kitchen contains two stoves and two refrigerators. It is complete with all cooking and eating utensils. Folding tables and chairs will also be provided. Fall Creek offers 228 campsites in three campgrounds. All sites have tables, grills, and water and electrical hook-ups. Central bathhouses with showers serve the campgrounds and a dump station is provided for self contained camping rigs. Campers must register at the campground check-in station. The stay limit is two weeks and select sites can be reserved. Fall Creek has two group camps, both featuring rustic bunkhouses clustered around central dining halls, bathhouses, and recreation buildings. Both camps provide private swimming beaches, playfields, fire rings, and private staff quarters. Backcountry camping is allowed. There are three backcountry campsites and a permit is required. Pack animals are not allowed in the park. Campsite Regulations:Each site may contain no more than eight people. A campsite may contain only one camping unit (motor home, trailer, pop-up, pickup camper, lowed camper, etc.) This site may also contain one tent but no more than three tents. All parked vehicles must not infringe on a neighboring campsite or block the road in any way. All sites must be paid for and the site marker posted. The site must be occupied by non-movable property. 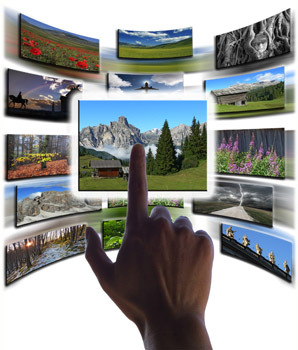 Examples of non- movable property are an erected tent, set up camper, vehicle, motor home, or human. Examples of non-acceptable property are coolers, chairs, tablecloth, rope or string. 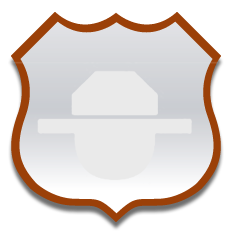 Sites held with non-acceptable property are subject to having property picked up by a ranger and the site rented. Accommodates 100 people. The camp consists of non-winterized cabins grouped in sections with four to six bunks per cabin. Bathhouses are centrally located. The kitchen and dining hall is complete with cooking utensils, walk-in cooler and freezer, commercial dishwasher, and large mixer. You must bring your own linens, toilet tissue, soap, towels, etc. Accommodates 144 people. Arrangement similar to Camp I. The camp consists of non-winterized cabins grouped in sections with four to six bunks per cabin. Bathhouses are centrally located. The kitchen and dining hall is complete with cooking utensils, walk-in cooler and freezer, commercial dishwasher, and large mixer. You must bring your own linens, toilet tissue, soap, towels, etc. The park has an olympic-sized swimming pool, a wading pool for children and ample sun-bathing space. Modern bathhouses and a snack bar serve the pool users. Lifeguards are on duty during swimming hours. No privately owned boats are allowed on the lake. Pedal boats, canoes and aluminum fishing boats may be rented through the park office. Trolling motors are no longer available for rent. Please bring your own trolling motor and battery. Pontoon boat rides may be arranged through the programming staff at the Naure Center by calling 423-881-5708. 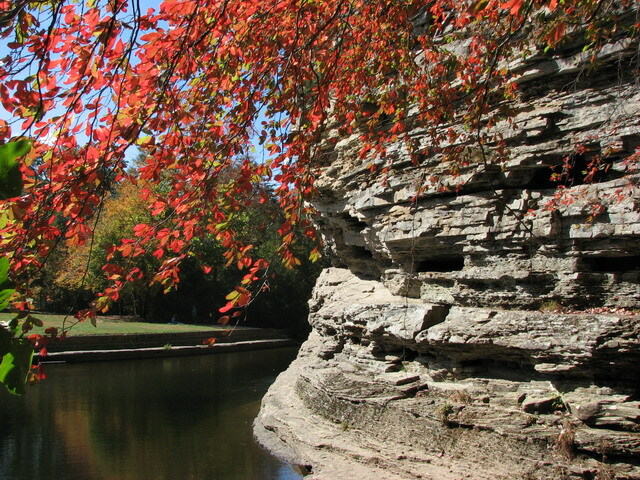 Fall Creek has 12 picnic areas scattered throughout the park with individual picnic tables. Grills are provided and water spigots are located nearby. There are 5 picnic pavilions that accommodate 75 people each. Reservations may be taken up to 2 years in advance. 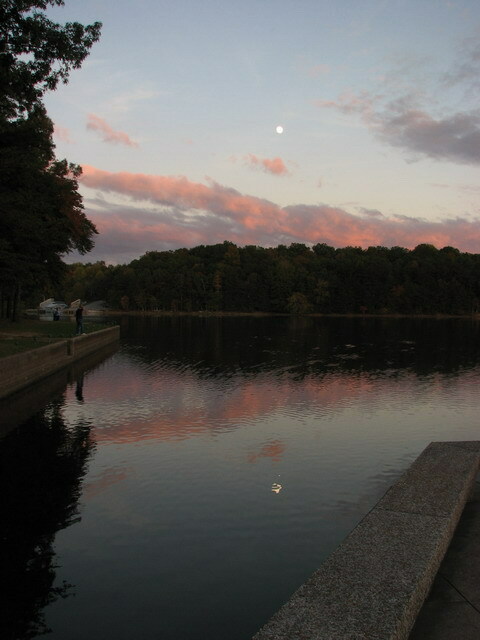 Most all picnic areas are accessible to persons with a disability and have some paved parking. 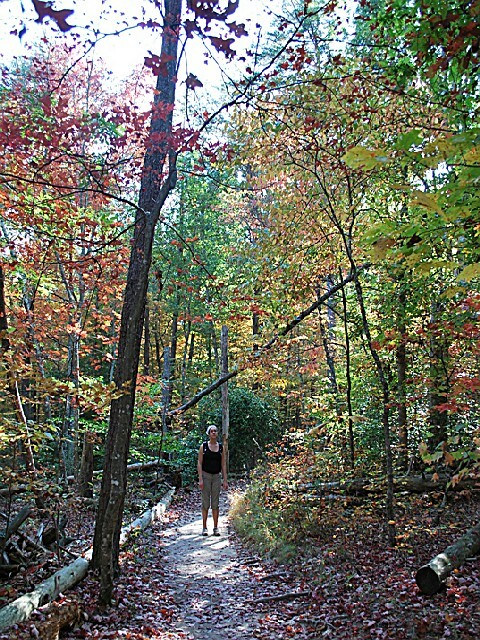 Fall Creek Falls State Park offers a variety of day-use trails. Providing access to some of the park's loveliest areas, the trails pass into virgin woods, over fast flowing streams, and around awesome gorges and waterfalls. 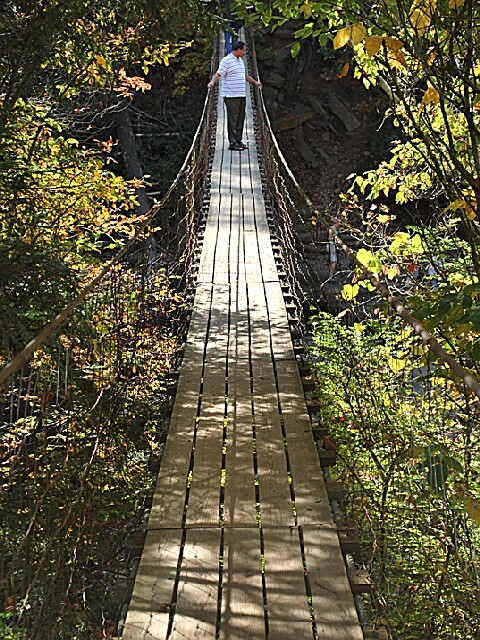 The day-use trails are designed to accommodate recreational and educational activities including fitness walking, leisure walking and easy hiking, or exploring the Parks' geological features and forest life typical of the Cumberland Pleateau. The Nature Center, located near the North entrance of the park, is a popular trailhead. Trail information is available inside the Nature Center. Trails also originate or can be linked from the village area, campground, inn, group camp #2 entrance gate, the Falls parking lot and the Piney Falls parking lot. 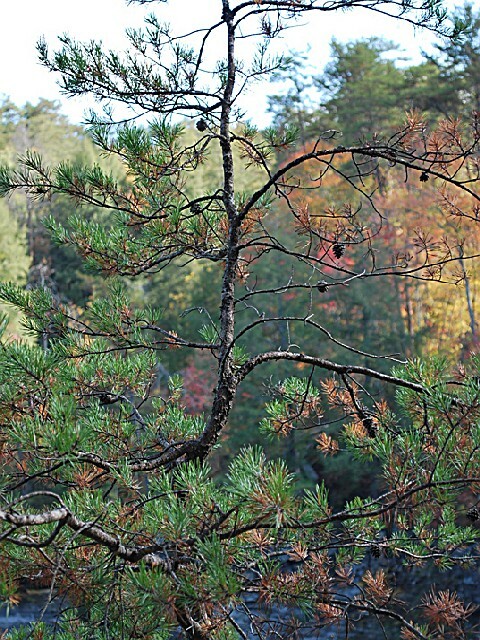 The Fall Creek Falls Overlook Trail is accessible to persons with a disability. From 15km races, backpacking trips and bicycle excursions, to rock climbing workshops, Fall Creek Falls SP offers activities for the whole family throughout the year. No matter where your interests lie, Fall Creek Falls SP has something for you. Contact the park for more information. I great comdonation of adventure and beauty. A very peaceful park with great views and chances to get close to nature. It is by far the best camp ground that my wife & myself love to go several times a year. We love to play golf & it fits our needs as for camping. The people that work there are super nice. My favorite vacation place for many years. The facillities are great and I love the staff at every level, especially in the dining room. From Nashville take I-40 East to Cookeville. Turn right onto 111 South (exit 288). Park entrance is on the left on Highway 284 (45 miles). From Knoxville, take I-40 West to Crossville, Peavine Road, exit #322. Take a left off the exit, onto Hwy 101 South. At the 4-way stop, go straight on Hwy 392, through the first traffic light (at Hwy 127). Continue straight to the 2nd traffic light (Lantana Road, Hwy 101). Take a left turn onto Hwy 101 South, and travel approx. 30 minutes to a dead-end. Turn left (still on Hwy 101 South) and go approx. 4 miles to Hwy 30. Turn right on Hwy 30 West. Park entrance is approx. 5 miles on the left (at Hwy 284). From Atlanta, take I-75 North to Chattanooga, take I-24 toward Nashville, take Hwy 27 North toward Dayton and follow Highway 111 North to the park entrance on the right.